Lacrosse, referred to in many Indigenous cultures as the Creator’s Game, represents a deep rooted tradition and family for the brothers. 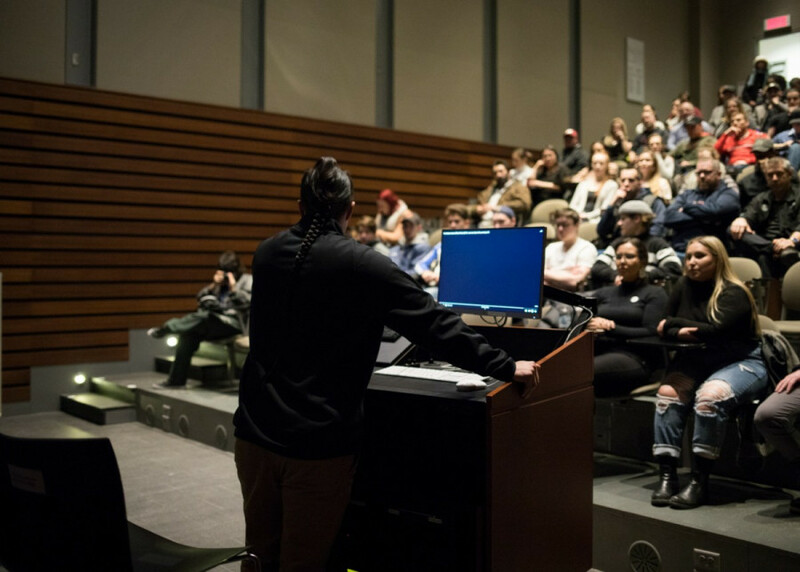 As part of First Voices Week at Concordia, three of the four brothers—Jeremy, Jerome, and Miles–spoke on a panel to a crowd of sports fans, athletes, and lacrosse players young and old, telling stories of their personal journeys and how they achieved their dream of playing the game professionally. For Jeremy, the path to playing lacrosse professionally nearly ended early. During the panel, the eldest Thompson opened up about his struggles with substance abuse as a teenager. “I came to my parents at a point where I’d just had enough, and where I told my dad I was suicidal and I really didn’t know where I was and just didn’t feel like I had a great value to what I was doing at the time,” he said. As he reached his breaking point, Jeremy turned to his father Jerome Senior for guidance. In the Onondaga culture, it’s tradition to give thanks to the water, the winds, the birds and the trees. Jeremy said nothing is a coincidence in terms of how his situation turned out, and how he overcame it. He gives credit to lacrosse and knowing the history behind it, describing the importance of the tradition behind it; things like the renewal medicine game, which takes place once a year to bring the community together and create protection for its people and lacrosse players entering a new season. He says he’s appreciative, thankful, and recognizes the importance of acknowledging the values of his culture, the same values his parents emphasized. “I’m currently now eight years sober from drugs and alcohol,” he said. From there, Jeremy set his sights on making a career out of playing lacrosse, starting off at Lafayette high school in Buffalo, New York. He and younger brother Jerome were flooded with offers from NCAA Division One schools across the country, but the brothers opted instead to start off at Onondaga Community College. Jeremy and Jerome wanted the NCAA life, and had their sights set on Syracuse University, but only Jeremy made the cut. Jerome entered the National Lacrosse League draft in 2011, where he was drafted 25th overall by the Buffalo Bandits. Discouraged by being passed over by Syracuse, he’d gotten out of shape and would not crack the roster until 2015. Through it all though, he was perseverant. He emphasized the importance of pushing oneself to achieve their goals, because of the feeling gained from achieving the goal after putting in so much work—an important message for a room full of young athletes. Miles, however, didn’t go the route of his older brothers, making it to Division One University of Albany right out of high school. Now, all four brothers are playing professionally in the NLL. Jeremy currently plays with the Saskatchewan Rush, while his three younger brothers play with the Georgia Swarm. “I’ve asked and they won’t let me go there,” Jeremy laughed. In January, youngest brother Lyle was the subject of a racist remark made by a Philadelphia Wings in-arena host, who said, “Let’s snip the ponytail.” Some people in the stands yelled about scalping him. To them, and Miles in particular, their ponytail is a way for them to represent their culture both on and off the field. All four boys were given the opportunity to cut their hair when they turned 18, and all four have chosen to keep their ponytails. Despite the hurt resulting from this incident, and similar incidents happening to Jeremy recently, the brothers try to remain positive. Now, the NLL has made a push to educate fans as a result of the incident, making sure to place importance on where the game comes from and what it means to Indigenous peoples. The brothers do the same, acknowledging the importance of having someone to pass on knowledge of the Creator’s Game to a new generation of players. In partnering with Nike N7 to put on lacrosse clinics for kids they’re able to do just that. The N7 camps are run exclusively for Indigenous youth, in order to keep the game and its story and traditions alive. The camp offers kids the opportunity to train with the brothers, considered some of lacrosse’s best and brightest. They’ll run drills and learn where the sport they loves comes from, and what it means to so many Indigenous cultures. 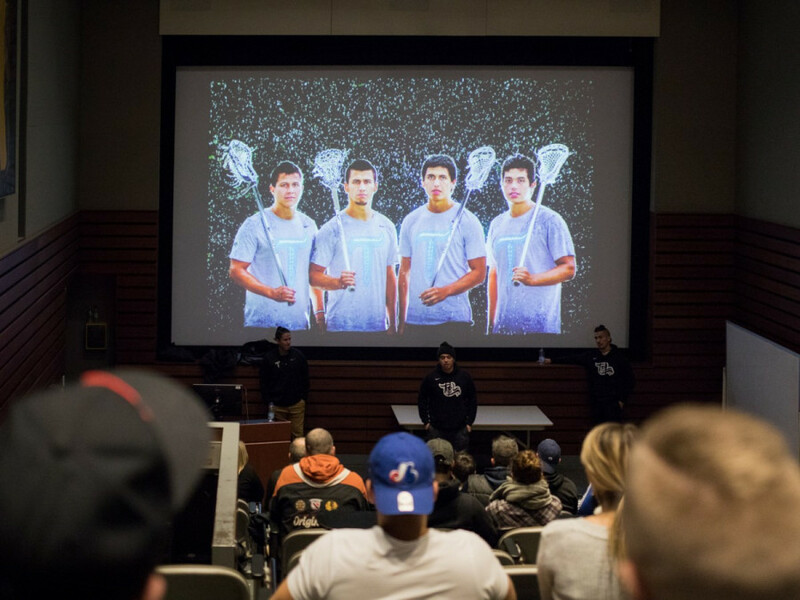 Traditionally, Indigenous culture is passed down orally from generation to generation, lacrosse included, and this camp is an example of how the Thompson Brothers are contributing to the next generation.